After a first look photo emerged last year, we've been waiting to get a glimpse of the teaser trailer for Ted 2, the follow-up to the 2012 comedy from "Family Guy" creator Seth MacFarlane. The good news is that the trailer will arrive by way of the sequel's official website www.LegalizeTed.com on Thursday. The website is in reference to the sequel's storyline that finds the title bear fighting in court for the right to have a child with his human girlfriend. And now there's a teaser poster to hype the film's release this summer, and it's very familiar to a teaser poster released for the first film. No points for the recycled joke, Universal. Look! You can still check out the first look photo from Ted 2 right here. 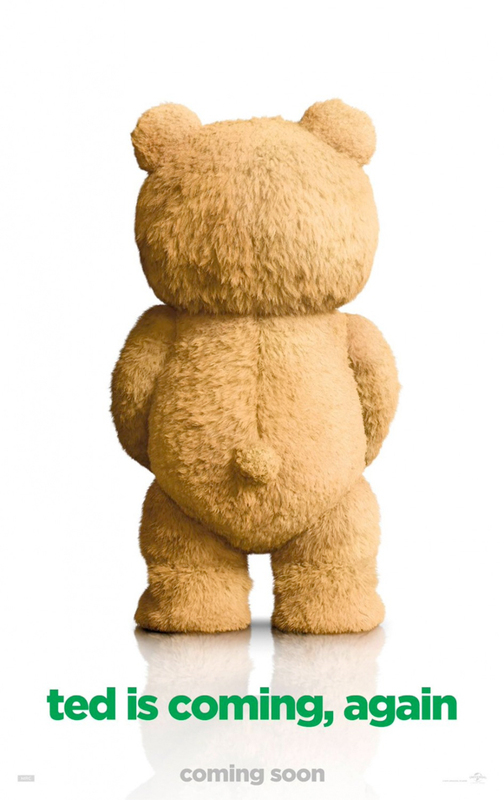 Ted 2 is directed by Seth MacFarlane, who also voices the title teddy bear, with a script he co-wrote with Alec Sulkin and Wellesley Wild (writers of MacFarlane's previous directing efforts Ted and A Million Ways to Die in the West). Plot details haven't been revealed, but part of the story will focus on Ted fighting in court for the right to have a child with his human girlfriend. Morgan Freeman helps him out as an iconic civil rights lawyer, and the film also brings back Mark Wahlberg in the lead with Amanda Seyfried taking the female lead. Liam Neeson and John Slattery also pop up in the film Universal releases June 26th, 2015. How dare he make films. OMG, he's jerking off. What comedy genius!